The Shop With Us team can’t stop swooning over chic outerwear pieces. With autumn in full swing, there is no time like the present to give our wardrobe a stylish update. While we have a number of trench coats, midicoats and cashmere toppers on standby, we’ve been browsing the racks for a new piece to add to our vault. Lucky for Us, we found a gorgeous design worth adding to our collection. After all, ’tis the season for bundling up in style! 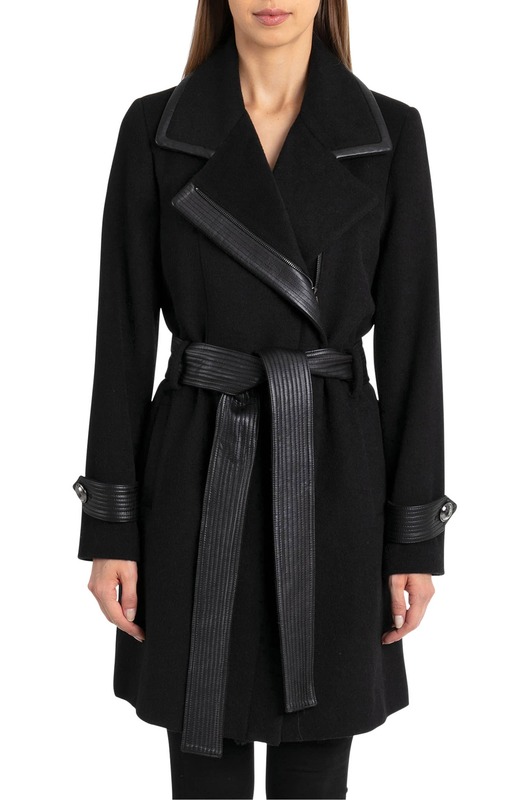 See It: Grab the Badgley Mischka Faux Leather Trim Wool Blend Coat at 50% off the original price of $300, now $149. 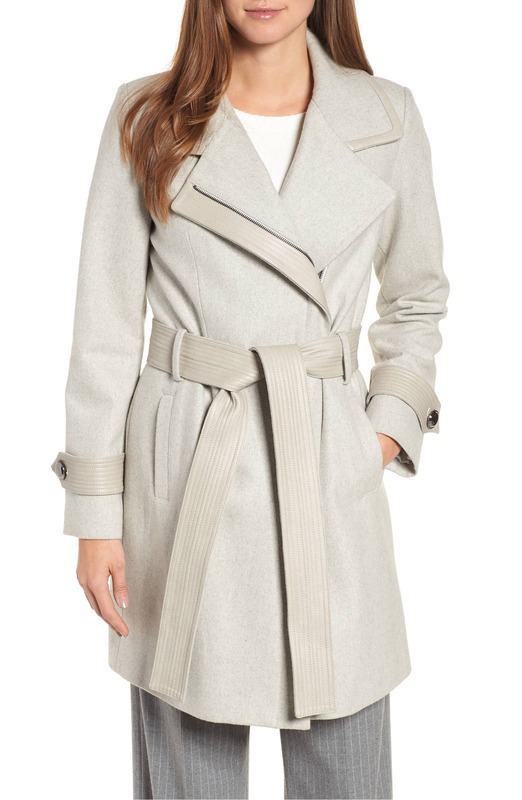 The Badgley Mischka Faux Leather Trim Wool Blend Coat is our latest obsession. Comfortable and stylish, this elegant offering will certainly take our style up a few notches this season. Designed with a combination of wool, polyester and other fabrics, this coat is the epitome of sophistication. Trimmed with trapunto-stitched faux leather along the notched collar, cuffs and removable tie belt, this garment offers a luxe feel that we can’t get enough of. This coat is also designed with a storm flap, as well as roomy front slant pockets to store our small essentials while we’re out and about. Complete with an asymmetrical front-zip closure, this topper can add dimension to our looks for a smart-tailored finish. Serving up a flattering finish, this piece nips at the waist for the ultimate curve-hugging number. For those who love a neutral hue, the black shade offers a classic touch. When we’re looking to add a bright neutral to the mix, the flint (grey-colored shade) offering is just the ticket. A great fall staple, this chic topper will look amazing with over-the-knee boots and loafers. We plan on hitting the streets wearing this coat with a black turtleneck, ponte pants and mules for an elegant ensemble. Normally retailing for $300, this fabulous piece is cruising the Nordstrom sale rack with a 33 percent markdown, leaving Us with a $200 price tag. A great way to snag a topper without making a dent in our wallet, this coat will become our favorite in no time. Its top-quality design and classic flair make this coat a winner with Nordstrom shoppers. Reviewers love that the lining has a luxe, silky feel, while others appreciate that this construction is warm and forgiving. Shoppers also like that this piece has enough room in the shoulders, while others like that its weight will hold up during winter. One reviewer noted that this design doesn’t have too much fabric bunching up under the belt for a sleek look without the annoying bulk. Many reviewers noted that this coat runs true to size. One reviewer also shared that they love this coat more in person than they did in the photo. Dubbed as a quality coat for the chilly weather, we are already making space in our arsenal. If you’re anything like Us, then you love serving up polished looks and we plan on wearing this coat with ballet flats, wide-leg pants, a fitted knit shirt, and a tote bag for a fall-approved ensemble. We can even switch gears with trendy booties, a wool sweater dress and a hobo bag for an effortless coffee date look this season. For days when we’re planning a night on the town with our beau, a leather miniskirt, bodysuit, booties, clutch and a bold lip will seal the deal. This coat can easily be dressed down to run errands. On those days, we plan on wearing leggings, slip-on sneakers and a long-sleeve T-shirt. Whether we’re dressing this stylish topper up or down, the possibilities are endless for a fashion-forward look. With sizes extra small to extra large currently available in select colors, now is the time to add this amazing find to your shopping cart (we already did!). When fabulous items like this hit the sale rack, there is no telling how long they will remain in stock. A fall staple that checks off all of the style boxes, this is a deal we don’t want to miss. See It: Grab the Badgley Mischka Faux Leather Trim Wool Blend Coat at 50% percent off the original price of $300, now $149.